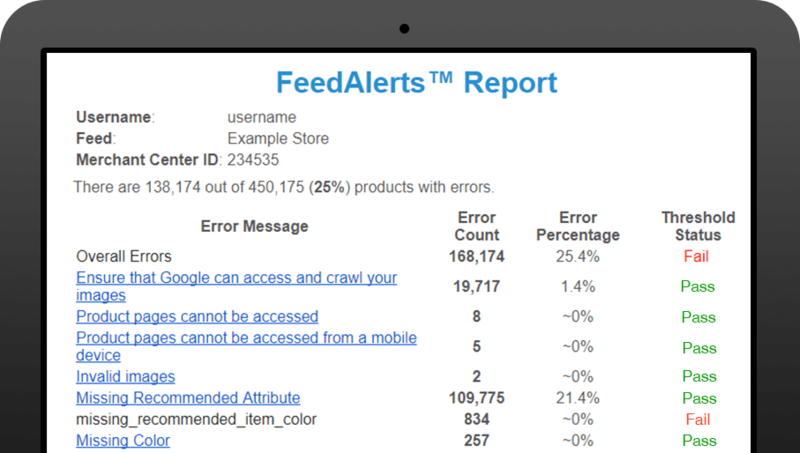 FeedAlerts™ is an easy way to receive notifications for Google Merchant Center (GMC) errors and warnings. Unresolved GMC errors and disapprovals can result in thousands of dollars of lost revenue per day. Automated– FeedAlerts™ automatically checks your Google Merchant Center account twice a day. Less Errors – FeedAlerts™ will notify you when you exceed an error threshold. More Sales – Less errors result in more active products and increased sales. Thresholds – Set thresholds on an overall and individual error basis. Saves Time & Money – Do more important things than manually checking for GMC errors. Client Retention (Agencies) – Don’t lose clients due to unchecked GMC errors. FeedAlerts™ is a game-changing tool that will save you time ensure your feeds are healthy. If your errors are feed based, we’ll fix them for you! 24/7 support at its finest. Email alerts list the errors as well as links describing how to fix them. If you’re an agency, you can easily see which clients have issues in one place. Catch these errors before they become a problem and ensure that your products are live on Google Shopping! With Full Service and 24/7 support, you can move forward with confidence!